San Francisco resident Richie Unterberger is the author of numerous rock history books, including Unknown Legends of Rock’n’Roll and a two-part history of 1960s folk-rock, Turn! Turn! Turn! and Eight Miles High. 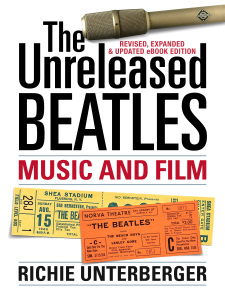 His book The Unreleased Beatles: Music and Film won a 2007 Association for Recorded Sound Collections Award for Excellence in Historical Recorded Sound Research. His latest books are White Light/White Heat: The Velvet Underground Day-By-Day and Won’t Get Fooled Again: The Who from Lifehouse to Quadrophenia. Turn! Turn! Turn! 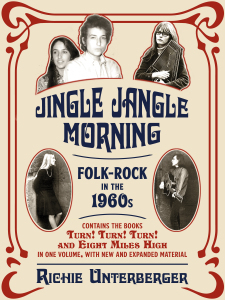 and Eight Miles High have now been revised/updated/expanded and combined into the ebook Jingle Jangle Morning, which adds a 75,000-word new bonus mini-book. He is also author of The Rough Guide To Music USA, a guidebook to the evolution of regional popular music styles throughout America in the 20th century; The Rough Guide To Jimi Hendrix; The Rough Guide to Seattle; and (as co-author) The Rough Guide to Shopping with a Conscience. He is a frequent contributor to MOJO and Record Collector, and has written hundreds of liner notes for CD reissues. Since 2011, he’s taught courses on rock music history at the College of Marin. He lives in San Francisco. He gives regular presentations on rock and soul history throughout the Bay Area incorporating rare vintage film clips and audio recordings, at public libraries and other venues. Since summer 2011, he has taught community education courses at the College of Marin on the Beatles, San Francisco rock of the 1960s and 1970s, and the history of rock from 1955 to 1980. For more info, go to richieunterberger.com. 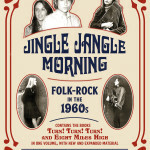 Combines my two-volume history of 1960s folk-rock, Turn! Turn! Turn! and Eight Miles High, into one volume with updated material, including bonus 75,000-word mini-book detailing nearly 200 tracks. Click here or on the cover image above to order through Amazon. Unknown Legends of Rock’n’Roll can be purchased by clicking here or on the cover image above..
Critical description of all known unreleased Beatles recordings, their most crucial unissued film footage, and more. Updated with 30,000 more words to reflect newly circulating material and additional information that’s come to light since the original edition. Click here or on the cover image above to order through Amazon. Documents twenty cult rockers from the 1960s. 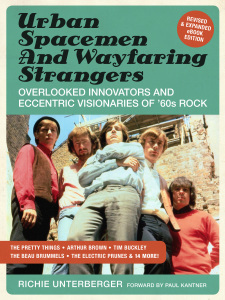 The book features extremely detailed investigation of the careers of greats like the Pretty Things, Arthur Brown, Richard & Mimi Farina, and Tim Buckley. The extensive chapters all include first-hand interview material with the artists themselves and/or their close associates. The ebook version is significantly expanded, revised, and updated from the print version, adding 20,000 words of new material. Click here or on the cover image above to order through Amazon. I am a big fan of your writings. You may just be the best music writer since Paul Williams. been reading your reviews since OP days! Tipped me off to many garage comps. I’m glad to have come across this blog, via an Ugly Things link. We live in Marin. Wanting to keep with information on outdoor hikes and would like to come to any talks that you might be participating in. Fine work Richie. I still think about OP magazine. Thanks. You’re the same Brian? Wow, it’s more than 30 years since I saw you in San Francisco. 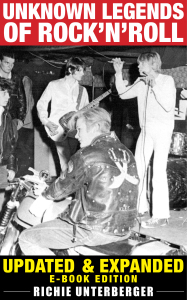 Greetings Richie….Back in 68-69 I was a member of the Elephants Memory…We did several film projects ( one with Ultra Violet) and a Ban Roll On radio commercial …I would like to find out current info. about these projects…If you or anyone has an interest, please contact me via E- mail for history details on this. I’ve long enjoyed Richie’s books and liner notes and reviews. For a guy “born too late” for his music’s first time around, you’d think he lived through every minute. My admiration for him is unlimited.